Aerial view, looking northeast, of the September 7, 1991 Cameron Cove debris flow in North Ogden (photo taken in August 1996). Debris flows are fast-moving slurries of rock, mud, organic matter, and water that flow down steep mountain channels and then spread out and come to rest on alluvial fans. Debris flows are triggered by rapid snowmelt or intense thunderstorm rainfall. Alluvial fans at the mouths of mountain drainages have gentle slopes and are favored sites for housing and other development. However, when debris flows travel out onto alluvial fans they can be life-threatening and destructive because they can occur with little warning, cause flooding and burial by debris, and have impact pressures large enough to push houses off foundations and collapse walls. Large-volume, destructive debris flows on alluvial fans are best described as relatively low-probability, high-consequence events where the time period between debris flows is often a period of deceptive tranquility. Since the state was settled by pioneers in 1847, debris flows in Utah caused 14 deaths and substantial property damage. One notable debris flow, the 1983 Rudd Canyon debris flow in Farmington, damaged 50 homes and caused $3 million in damage. Many areas of the Wasatch Front are particularly at risk from future debris flows, because a high population density exists on alluvial fans where no protective measures have been taken. A debris-flow-hazard evaluation is necessary when developing on geologically young alluvial fans to ensure safe development. To help provide for consistent and systematic debris-flow-hazard evaluations, the Utah Geological Survey is preparing a report titled “Guidelines for the Geologic Evaluation of Debris-Flow Hazards on Alluvial Fans in Utah.” These guidelines will assist geologists in evaluating debris-flow hazards. The purpose of a debrisflow- hazard evaluation is to determine if a hazard exists and, if so, to provide geologic information needed to design risk-reduction measures. The guidelines focus the hazard assessment on two specific areas: the drainage basin and the alluvial fan. For most hazard assessments flow volume is the most important factor in addition to flow frequency, impact pressure, runout distance, and sediment burial depth. Debris flows start high in the drainage basin and increase in volume as they travel down channels, scouring and incorporating sediment. Geologists can estimate potential debris-flow volume by assessing the sediment-supply conditions in the drainage basin. Therefore, the hazard evaluation of the drainage basin focuses on the channel sediment supply, erosion conditions, and surface-water runoff conditions that ultimately determine the volume of material that reaches the alluvial fan. Study of historical debris flows indicates 80 to 90 percent of the debris-flow volume is eroded from channels; therefore, determining the volume of available channel sediment is critical to the hazard evaluation. The amount of sediment stored along channels is estimated by field surveys of channels in the drainage basin. Debris-flow deposits on alluvial fans provide a record of past flow volumes and runout. The hazard evaluation on alluvial fans follows the idea that the general areas where debris flows have deposited sediment in the recent geologic past are where they will likely deposit sediment again in the future. Alluvial fans are landforms composed of a mixture of debris-flow and stream-flow deposits. Geologists describe and analyze the debris-flow deposits exposed in subsurface excavations to understand past debris flows, including estimating how frequently debris flows occur, typical volumes of past flows, typical sediment burial depths, and runout distances on different parts of the alluvial fan. By understanding the behavior of past flows, geologists can estimate the hazard that future debris flows might present. 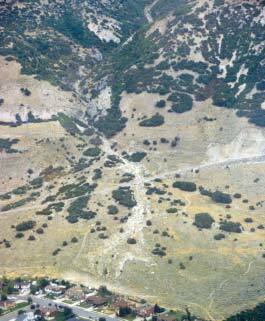 • Santaquin and Spring Lake, Dry Mountain debris flows, 9/12/02, Mollie fire (see related article in this issue). Historical records of debris flows in Utah have shown the flows to be highly variable in terms of size, material properties, and runout distance; therefore, conservative design parameters must be used in risk reduction. The guidelines focus on obtaining geologic information to understand and describe the hazard to help hydrologists and engineers model the hazard and design risk-reduction measures.